Anthony Beauchamp Entwistle was born in England towards the end of World War I, in 1917 or 1918. His father was Ernest George Entwistle, who established an art school at St Pancras, London, with the illustrator, J.H, Valda, from 1895-1912. Anthony’s mother, Florence Vivienne Mellish – better known as ‘Vivienne of London’ – married Entwistle in 1913, and they had one other son, Clive, who became an architect, and also designed a rocket used as a secret weapon during World War II. Vivienne, an accomplished miniaturist, joined Anthony as a photographer’s assistant in 1934. She became one of the eminent society portraitists of her era, counting Winston Churchill and Vivien Leigh among her many distinguished subjects. They moved to Los Angeles, and Sarah starred alongside Fred Astaire in the 1951 musical, Royal Wedding. Tony briefly considered taking up acting himself. Shortly before leaving England, Beauchamp had photographed a young actress named Audrey Hepburn. His portrait is included in Audrey 100, a book of favourite photos personally selected by the star’s family. Once in Hollywood, Anthony soon became one of the most sought-after portraitists of the post-war age. The young Elizabeth Taylor posed for him, and in 1951 Anthony captured that most enigmatic of stars, Greta Garbo, in a rare colour series. His fame soon spread, and he photographed First Lady Margaret Truman in the same year. Anthony first met Marilyn Monroe in 1950, through her agent (and lover), Johnny Hyde. He first photographed Marilyn at an acting class at the home of Charles Laughton, and invited her to a party at the Santa Monica beach-house of Ben Lyon (the talent scout who ‘discovered’ Marilyn in 1946, and who had invited the Beauchamps to stay in his home after moving to England.) That night, British actor George Sanders proposed marriage to the ‘deliciously pneumatic’ Monroe, but she politely turned him down. Sanders was already married to another blonde actress, Zsa Zsa Gabor, who (needlessly) scolded Tony for inviting ‘that kind of girl to a party’. Months later, when Marilyn played Sanders’ love interest in All About Eve, Gabor warned him to stay away from her alleged rival. That December, Hyde died suddenly. Monroe was heartbroken, according to Elia Kazan, who visited her on the set of As Young As You Feel in early 1951. Nonetheless, she was determined to be a star. In between movie roles, Marilyn posed for magazine shoots. She had begun her career as a model and was fast becoming the nation’s pin-up as a new war raged in Korea. Over two weeks in the spring of 1951, Anthony photographed the 24 year-old Marilyn, and extended his hospitality to her. Their collaboration made a striking contrast with Beauchamp’s more sophisticated portrait work. Marilyn wore the yellow bikini she had used for cheesecake snaps dating back six years, and another two-piece made from terrycloth. In a series of black-and-white shots, a sleek, honey-blonde Monroe ran along Santa Monica beach, a favourite haunt since childhood. Eager to please, she crawled in the sand, performed handstands and turned cartwheels; and in one sequence, aimed a bow and arrow. The raw energy and sensuality she exuded were a far cry from the ‘girl-next-door’ image favoured by other Hollywood blondes. In a series of colour photos, Marilyn rests languidly across a lounger, on a balcony. Anthony also photographed Marilyn in an elegant, high-necked dress, lying on a beach towel. 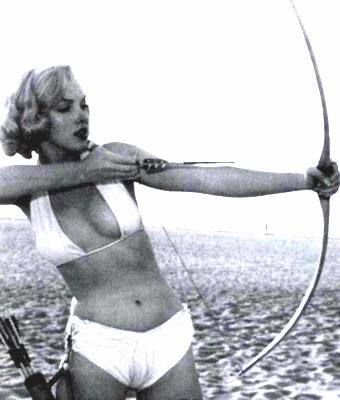 In retrospect, the unusual quality of these photos is light years ahead of its time, with one blogger describing the archery sequence as a pivotal moment when ‘The Hunted Became the Huntress’. Monroe, so often dismissed as a ‘dumb blonde’, looks anything but a passive beauty here, though she retains her playful, kittenish charm. The beach session made the cover of Focus magazine in March 1953, for a cover story with the teasing headline, ‘The End of Marilyn Monroe’, referring to the avalanche of publicity that Marilyn was now receiving. Beauchamp’s colour shots of bikini-clad Marilyn were still gracing covers of magazines like Eye, Cheesecake, and The Male Point of View as late as 1956. During the late 1940s, Tony had been a member of the Thursday Club, alongside Nahum Baron (who photographed Marilyn in 1954), the writer Sigmund Miller, and Dr Stephen Ward, the osteopath and artist implicated in the Profumo Affair of 1963. Beauchamp, along with Ward, also frequented the Little Club in Knightsbridge, where Ruth Ellis was appointed manageress in 1953. Two years later, 28 year-old Ellis became the last woman to be hanged in Britain for the murder of her violent lover, David Blakeley. Ellis’s biographer, Monica Weller, believes that Anthony, like Ward, exploited pretty, troubled young women, including Ellis. But while there is direct evidence linking Ward to Ellis, the true nature of her friendship with Beauchamp seems less clear. Sarah was becoming addicted to alcohol and this damaged her career. She was arrested several times for causing a public disturbance while drunk, and even spent a short spell in Holloway Prison. She and Tony decided to live apart, though they had no plans to divorce. In 1956, Marilyn Monroe – now one of the world’s most glamorous stars – came to England to film The Prince and the Showgirl with Sir Laurence Olivier. It’s not known if she met Tony during her stay, though he knew the Oliviers quite well. When not filming or giving interviews, Marilyn spent her much of her time with her new husband, Arthur Miller. By the summer of 1957, Monroe was expecting a baby and relaxing in a holiday chalet with Arthur in Amagansett, near East Hampton. Sadly, the pregnancy was ectopic and had to be terminated, bringing a tranquil, settled period in Marilyn’s life to an abrupt end. Over in London, Anthony was putting the finishing touches to his autobiography, Focus on Fame. Early in the morning of Sunday, August 18, Anthony was found dead at his flat in Hyde Park Gardens after taking an overdose of barbiturates. A policeman told the Glasgow Herald that he was lying on a bed, fully dressed, his hand hanging limp by a telephone. An empty box of prescribed pills was found at the scene, though no drinking glass was located. Focus on Fame was published posthumously in 1958. Almost five years after Anthony’s passing, on August 5th 1962, Marilyn Monroe was found dead in very similar circumstances – alone in her bed on a Saturday night, clutching a telephone, having ingested a massive overdose of barbiturates. Marilyn was 36 when she died; Anthony Beauchamp was 39. Had he lived longer, might now be as well-known as other British photographers like Cecil Beaton and Norman Parkinson. His mother, Vivienne, inherited his photographic archive and remained devoted to his memory until her death in 1982. Interesting piece above. I have read Monica Weller’s biography of Ruth Ellis and the circumstances surrounding her life and death and I have to say it is one of the best books I have ever, ever read !!! Sorry, I’m not aware of one – I was going to suggest the NPG, before noticing your domain! Many thanks for your kind words, and glad you enjoyed my article. Do you know of a photograph of Leigh, Olivier, Monroe and Miller outside Parkside House (preferably not Getty)? Do you know if he ever came to Orkney? I’d love to know what his connection to Orkney was. A very interesting man. Hi Tara, I have replied to the Orkney museum with the following information: Vivienne, Anthony Beauchamp’s mother, was in Orkney during the Second World War. She corresponded with Winston Churchill during that time. I wrote a long article about the connection that was published not that long ago in the Scots magazine.